Samuel Strickland III was born in Kinston, North Carolina. His parents taught him from an early age the value of hard work and a good education. He graduated from Kinston High School in 1973 and enlisted in the U.S. Air Force. Dr. Strickland served honorably for 26 years and retired with the rank of Senior Master Sergeant with numerous awards and medals. He received a bachelor’s degree in Psychology in 1993 from Saint Leo College in Florida. He later completed his master’s degree in Adult Education in 1996 from the University of South Florida. 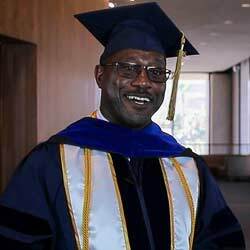 After retiring from the Air Force, Dr. Strickland went on to earn his Ph.D. in Educational Leadership from Trident University in 2015. He credits his success at Trident to Dr. Wenling Li. As Dr. Strickland worked through his Doctoral program, Dr. Li inspired him to reach higher and keep going. Things got really tough when Dr. Strickland began battling cancer. There were many times he wanted to give up, but he continued to look to Dr. Li for support and inspiration. He believes that without Dr. Li, he would have given up. Dr. Strickland applauds Trident University as a whole for standing by him and giving him the opportunity to continue his program to completion.